Then I gave a go at the rays coming from the center and pointing to the feature blocks. By George, I like it! It's kind of a wrestling match but if Idon't do too much at a time, it's fine. Sue's hat was kind of bumpy from the fusible web so I did some lines on it and that calmed it down well. The little girl blocks quilt up quickly but the triangles take a while but I think it will be worth it. Had Sit and Sew this week. It's been a spell since I've seen some of the girls and I really looked forward to Tuesday. It was a really fun day. It was Leslie's birthday - wish I had known it beforehand. Leslie is so much fun and one of my favorite people! What a great bunch of quilters in our group!! So a big, belated happy birthday to one great gal!!! Today is the "garage sale" at Park Bench!! Can't miss that! Looks like they are going to have stellar weather for it this weekend. I am going to eat some lunch, get cleaned up a bit and go garage saleing!!! Will show you later what I buy. Very pretty and colorful! The quilting designs looks nice, and yes, I find deciding how to quilt the blocks is the most difficult part of quilting for me. 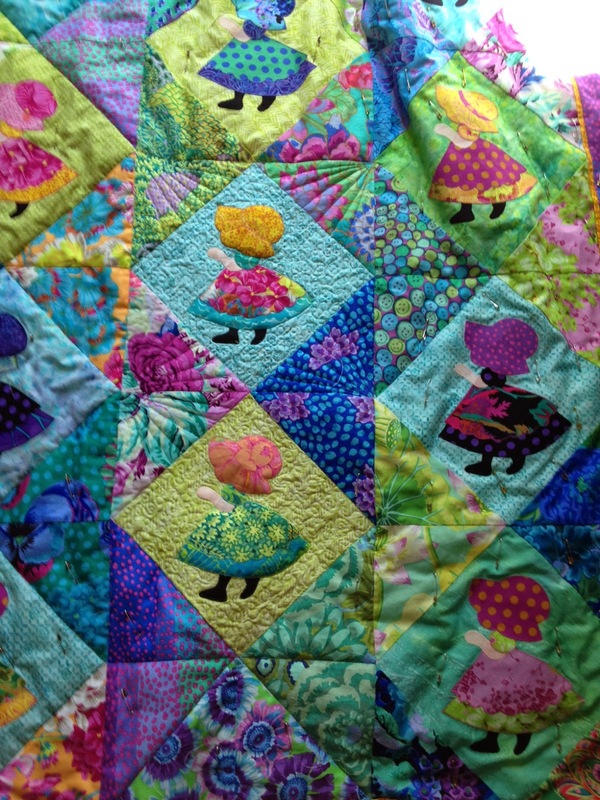 Are you machine quilting this one? THank you for the birthday wish, you are so very dear to me as we'll. Hi, Carol! It has been a bit for me to pop in, but you still have such great inspiration going. 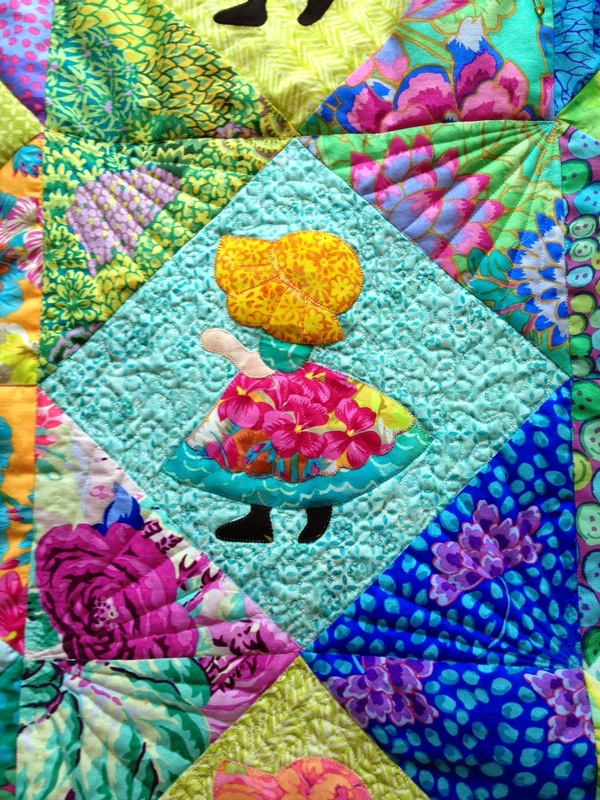 What a neat update to ol' Sunbonnet Sue, your quilting is perfect for the job, too. Hope your week is wonderful!